On Saturday January 3rd, Dutch BBG members held a very pleasant New Year meeting in Utrecht. First we were given a guided walk by Maureen Peeck, who has been living in this city for a good many years. We saw a lot of medieval remains and even some Roman ones. Absolutely fascinating! It was followed by a very good dinner at a restaurant. Last year we had two pleasant Dutch meetings, occasioned by visits of foreign guests. We now hope that a New Year and summer meeting will become a tradition in Holland. It's something I at least have been wishing for a number of years. Now, thanks to the BBG, it has become possible. 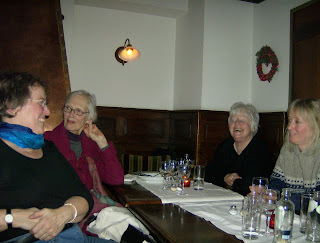 Talk given by Maureen Peeck in Brussels on April 18, 2008 to the Brussels Brontë Group, the Belgian branch of the Brontë Society, on the occasion of the Annual Brontë Weekend. The Belgian Essays: Charlotte and Emily Brontë, edited and translated by Sue Lonoff, Yale University Press, 1996. One of the best things that happened to Charlotte and Emily Brontë when they went to Brussels in 1842 was that they encountered what must have been one of the best teachers working in Brussels at that time – Monsieur Heger. Charlotte was 25 and Emily 23 years old, so they were a bit old to be going to boarding school. Nevertheless, M. Heger’s teaching methods were perfectly in tune with their stated aim in coming to Brussels which was primarily to learn French. This, with his help they did. His method was to present them with good examples of French style, be it literature, history or philosophy and have them write essays (or devoirs) in a similar style, either on the same topic or one like it. He believed that by imitating or, as he called it, “emulating” masters of the language they would learn French and also improve their own writing style. (Presumably he didn’t know that the two were extremely experienced writers already!) This system suited Charlotte down to the ground and she revelled in the opportunity she had been given to impress her teacher and show off her knowledge. Emily was a different case: she didn’t “draw well at all” with M. Heger (as Charlotte said) and didn’t want to co-operate in the venture, believing that imitation would spoil any originality that the pupil might possess. But having come to Brussels, with however much trepidation, to learn French she could hardly refuse to do her homework. And she made huge strides in French. It becomes clear that Heger soon realised that both young women were extraordinarily gifted and he adapted to each of them in his own way, but without relinquishing his teaching methods. Thus, he would often simply correct Emily’s French but give little other comment, evidently recognising her independence of spirit, whereas he would go into enormous detail in the case of Charlotte, making suggestions and helping her improve her arguments, recognising her need to bow to his authority. So Emily was left more or less free to state her case as she wanted without too much interference from her teacher. And that teacher must sometimes have been quite surprised at what he had on his hands. Later, he even went so far as to say, in that very famous statement, that Emily “should have been a man (!) – an explorer”. In all there are 28 surviving essays, 19 by Charlotte and 9 by Emily. This evening I just want to mention two of Emily’s essays, namely “The Cat” (“Le Chat”), dated May 15 1842 and “The Butterfly” (“Le Papillon”), dated August 11 1842. These are two of the most famous of Emily’s essays. Please note I will be quoting from the essays in the English translations. The speaker in “The Cat” begins by stating that she really likes cats. We can guess that the example Emily was supposed to be imitating was something along the lines that cats are to be despised on the grounds that they are so utterly selfish and never have the slightest interest in being loyal or affectionate to their masters or mistresses in return for the care and affection they receive; and, moreover, they are despicable because they are prepared to kill other creatures, like mice, for pleasure. What Emily does is give the essay the twist she wants by bringing human beings into the argument – and not to their advantage, which would have been the conventional thing to do. I paraphrase: Although the cat differs is some physical points, it is extremely like us in disposition. There are those who would say that a cat’s excessive hypocrisy, cruelty and ingratitude only bears comparison with wicked humans. Well, replies the speaker, in that case this will include the whole human race. Now I quote: “Our education develops one of these qualities in great perfection, the others flourish without nurture.” So in Emily’s essay hypocrisy is the one we are taught, cruelty and ingratitude come naturally. Here ingratitude means “not appreciating, or being inclined to return kindness.” This is the dictionary definition. I quote again: “A cat, in its own interest … instead of tearing what it desires from its master’s hand, approaches with a caressing air … and advances a paw whose touch is as soft as down. When it has gained its end … it resumes its true character … and that artfulness … is called hypocrisy. In ourselves, we give it another name, politeness, and he who did not use it to hide his real feelings would soon be driven from society.” And so the essay goes on, expatiating on the cat’s and man’s cruelty and ingratitude. Not quite what M. Heger had in mind, one would have thought. This satirical and sardonic essay with its Byronic misanthropic pose ends with a statement that cats can’t really help being what they are, and that it was all Adam’s fault in the first place for getting the animals thrown out of paradise along with himself. And possibly this speaker likes cats more than humans. The theme here outlines in a nutshell one we often come across in Emily Brontë’s work: namely that beneath the veneer of civilization people are “all for ourselves in the end,” as Nelly Dean puts it in Wuthering Heights. In this pessimistic view of humankind everyone is to a larger or lesser degree hypocritical, cruel and ungrateful, so how then dare we accuse others of these vices? In the second essay, “The Butterfly,” a different position is taken up, one more in keeping with a Christian world view. Again there is a dramatic situation, this time with an individual recounting an event in his or her life. It begins with the speaker again expressing a jaundiced view of the world: “All creation is equally mad, behold those flies playing above the brook; the swallows and fish diminish their number every minute. These will become in their turn the prey of some tyrant of air or water; and man for his amusement or his need will kill their murderers. Nature is an inexplicable problem; it exists on a principle of destruction. Every being must be the tireless instrument of the death of others, or itself must cease to live, yet nonetheless we celebrate the day of our birth, and we praise God for having entered such a world.” (Note here how nature and mankind are all of a piece; as in “The Cat” man is not pictured as a higher being than animals.) In this despairing mood she then crushes a caterpillar underfoot, thus preventing it from ever becoming a beautiful butterfly. Having thus shown herself to be as cruel as any other creature, and moreover having the audacity to question God’s intentions, she sees a butterfly emerging from the forest and is suddenly granted a moment of vision. An inner voice tells her: I quote “As the ugly caterpillar is the origin of the splendid butterfly, so this globe is the embryo of a new heaven and a new earth whose poorest beauty will infinitely exceed your mortal imagination. …. God is the god of justice and mercy; then surely … every suffering of our unhappy nature is only a seed of that divine harvest ….. ” So here one can say that the wickedness, and thus the suffering it entails are all part of the divine plan. In this view there will be no hell, and there will be no doomed men and women because God will have mercy on all. For Emily Brontë the most divine of virtues was that of forgiveness. In the poetry we see time and again a wicked man whom men say even God will not forgive, being saved by the love of a woman who is prepared to forgive him. And think of the wolfish Heathcliff, a man portrayed as not that different in kind from an animal or any natural force. He has no desire for the kind of heaven described in “The Butterfly,” yet he too, we are led to feel, deserves his kind of heaven. The crucial doctrine as proposed in “The Butterfly” is that of Universal Salvation. This was the view held by some of the dissenting Christian faiths with which Emily and Charlotte would have been familiar. It is not that of the Anglican faith in which the Brontës were nominally brought up. And certainly not of the Catholic Church, so one can’t help feeling that Emily was out to shock or at least provoke the Catholic M. Heger. Emily Brontë did not suspend her own agenda just because she was abroad. She continued to write poetry – she wrote at least three poems – and, as we see, used the essays to work on her own ideas. She does not express the conventional view of nature giving us a glimpse of God’s greatness, nor the notion that human beings are superior to and separate from animals. Imagine this woman writing such essays in a respectable Catholic pensionnat for jeunes demoiselles. The way she interpreted what Heger wanted her to do must have seemed to him to transgress what was appropriate for a woman to write about and it is perhaps for this reason that, being at a loss, he said she ought to have been a man!